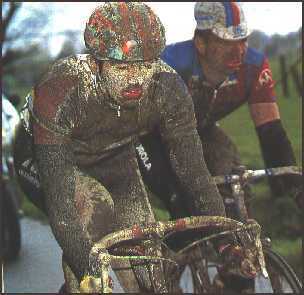 "Brutal", reported Cycling Weekly, was how Motorola's George Hincapie described the 1994 Paris-Roubaix. If it was brutal to ride it was sheer terror to watch. As I sat glued to my armchair in my dry, centrally heated apartment I remember that outside it was snowing reflecting the conditions that the riders had to endure in the most astonishing race I have ever witnessed. The result was almost meaningless - what was important was survival and every one of the 48 finishers was a hero and many others who lost the battle fought honourably enough to deserve a medal. Andrei Tchmil won, averaging 36.16kph over the 270 kilometres. 7 hours 28 minutes and 2 seconds of the kind of body shattering torment which for most of us will remain a nightmare. Just under 21 minutes later the last of the 48 rode in to a hero's welcome. As always luck was to play its part. Winner Andrei Tchmil escaped puncture- free on a day when the farm tracks over which a large part of the race is run off were awash with mud. 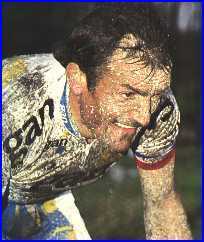 Second placed Fabio Baldato lost count of the number of times he punctured and fell off. Cycling Weekly kept count for him - three crashes and five punctures! The peoples' favourite - Gilbert Duclos-Lasalle (left) punctured at just the wrong time and his heroic effort to get back and then to lead the chase was awe-inspiring to watch. Ridden off in conditions which would make even the most devoted coureur think twice about going out training, the race see-sawed its way across northern France with no real pattern other than that the hard men inexorably made their way to the front. 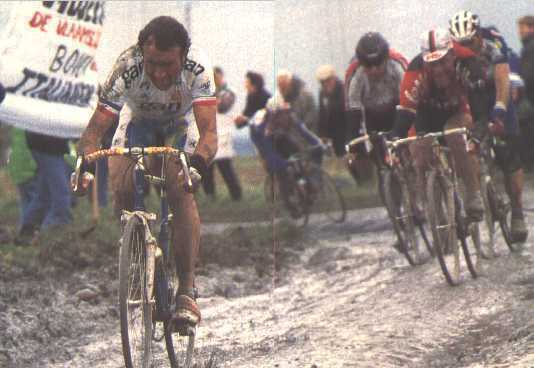 The leaders were constantly changing until with 30 miles to go, took off through the rain and mud leaving Museeuw - who had looked strong throughout - desperately trying to close the gap in some kind of hellish pursuit. At one time Museeuw closed to within six seconds, then Tchmil put the pressure on, Johan had to make a bike change and the rest, as they say, is in the history books. I intended to do some sort of in-depth analysis of the race but so much happened that it would be folly to try and recapture the excitement, tedious to describe in simple words the way the race unfolded. To put it bluntly, I can't do it justice. How can you describe something like the way Johan Capiot looked (seen right with Sean Yates) and make sense of it? Nobody could, although the blood the sweat and tears of that Paris-Roubaix are captured eloquently in the photos in this article - let's hope for our sake that this year's race is just as exciting and let's hope for the riders' sake that it's not!